These instructions are for Standard and Professional Plans Only. If you have signed up for an Enterprise Plan then please contact our office and one of our qualified consultants will assist you with starting iTimeClock on the device. 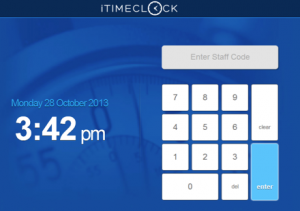 Before your Staff can start using iTimeClock you need to complete a few simple steps which are listed below. Open up a web browser on the device and type in a popular website address such as www.google.com.au. If the site does NOT come up then check your Wi-Fi or 3G internet connection. If necessary contact your telecommunications provider to assist you with getting your device connected. The following Login screen should come up in the web browser. 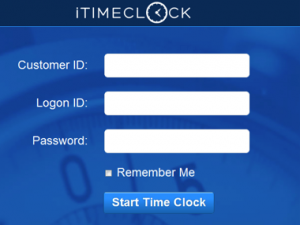 Enter the Administrator login details used to access the iTimeClock Administrators Console. Press the ‘Start Time Clock’ button. Note: If you select the ‘Remember Me’ checkbox then the system will automatically pass-through the login credentials the next time you attempt to start iTimeClock and should take you directly to Step 3 below. 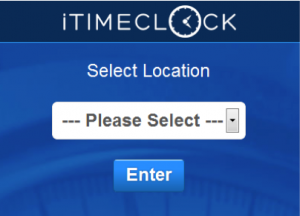 If your iTimeClock system has been setup to track time against multiple sites then choose your Site from the Location drop down list as shown in the screen capture below. Press ‘Enter’ to start iTimeClock on the device. That’s it, iTimeClock should now be started on the device and your iTimeClock interface should appear similar to the screen below ready for your staff to clock in/out.